I had bad skin growing up. I had bad acne and pimples during my adolescent years that I was in the Derma every week. My skin improved, Thanks to Dra. Lim Ke! But nakakatamad bumalik-balik and to wait for an hour or two for my turn even when you set an appointment! My mom takes good care of her skin. I remember her having facials where a scramble egg looking mask is put on her face. She's been using Shiseido for as long as I can remember! When I was single, I had more time to put on whatever cream that my mom buys for me. When I got married, wala na akong time! Glad that my mom still buys for me. Or naawa lang talaga siya sa skin ko hahaha! So I'm sharing with you my skincare musts! Shiseido for my face, minsan Celeteque. 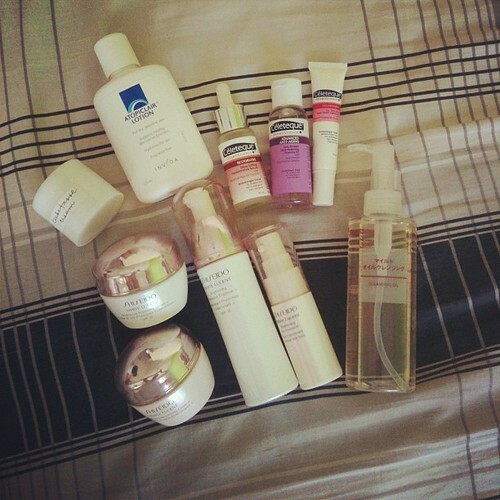 Muji Cleansing Oil for make-up removal and lotion and meds for my skin asthma! What's your skincare regimen? Skincare secrets? Share!!! I had a serious attack on my face last year I got big sunburns on my skin and red cheeks consequently one of my friend suggested me a cream and a an anti fungal soapand the soap worked for me.That was a big relax to me. I don't believe you had bad skin Cai =). I get bored with just 1 skin care set, so I try different brands. But 1 thing that's permanent in my routine is the Celeteque Break Off capsules. Love them till the last drop. Haha naku! I've been called a lot of names during my teenage years! I want to try those capsules!